Yes, the story in the book is a true one. Or at least as true as any story in any book will ever be. The evidence? 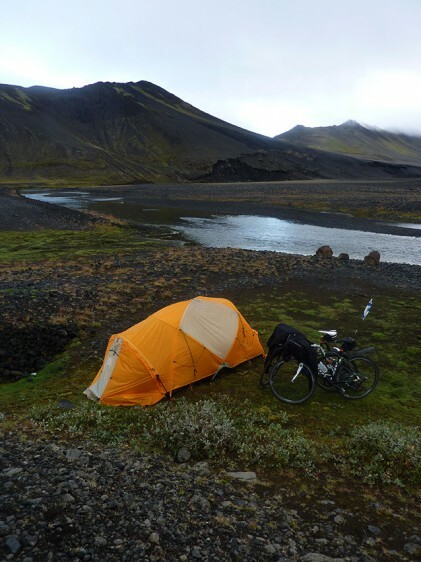 A selection of blog postings from our days on Iceland. Now don’t just you wish you would’ve tagged along? We once again awoke up in our tent. Not quite sure where. Next to some big hill that we didn’t have the energy to climb yesterday. And on road number 1. Hah! Quite cold, even though it has ceased raining. At least for now. The downside is that we really don’t have that much to eat. But we go to get going, since there’s nothing here. Putting on the same wet clothes never gets any easier. 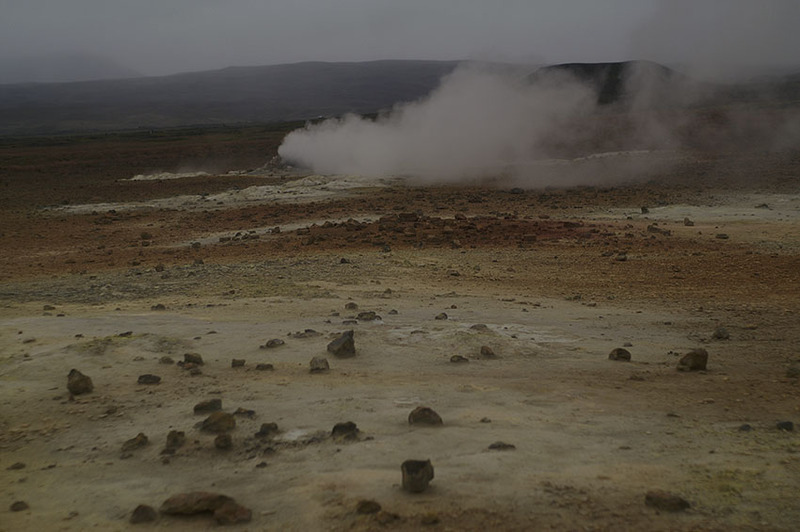 After cycling almost 60 kilometers and seeing absolutely nothing during the whole day we suddenly land in Hverir. It’s a surreal sight. 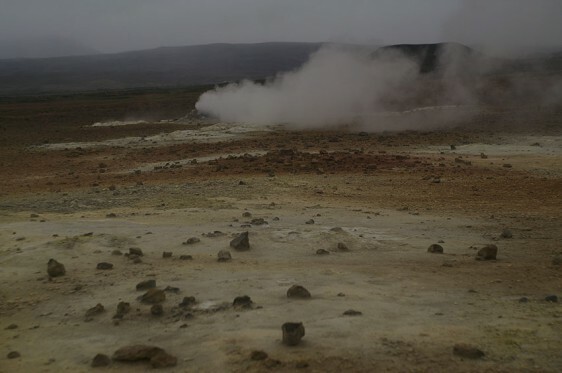 Located close to lake Myvatn , it’s a place where hot mud pools bubble and steam hisses up from cracks in the ground. Smoke smolders from piles of rocks. I think this is as close as one can get to the days when earth was born. Exciting times. 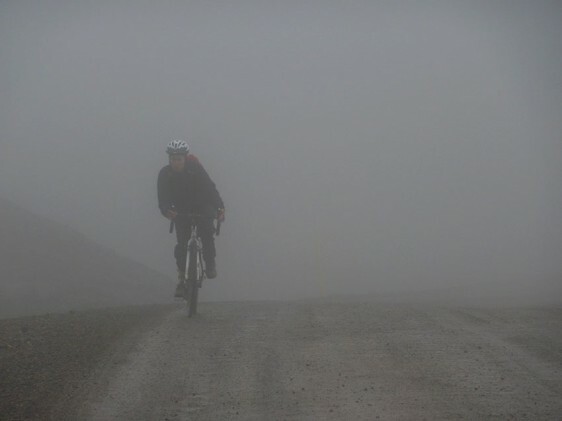 And I am left wondering: Is there really any difference between fog and clouds when cycling at high altitudes? At the very least they both are cold and wet. As am I.
I will admit one thing to you: I always hated camping. Honestly, I never got it. Why would you leave your perfectly good house, to suffer in nature? But as unlikely as it seems, it’s started to grow on me – the carefreeness of being able to stop where every you like. And to even my own astonishment, I feel this newfound independence to be intoxicating! No. 1 outdoors woman in the world! It took us more than an hour to reach the mountaintop, literally covered in a cloud. Much less to get down, though. Only thing we were left wondering about was the small hut almost on the top. Couldn’t have been more than six square meters. Next to this giant antenna. Was it a shelter for drivers stuck in the snow? The mountain ranger’s home? The ultimate hermit’s summer cottage? Or just the perfect place for relocating annoying neighbors? It’s interesting to think about how the mind works. This day we have been riding right next to the Atlantic Ocean, and somehow it felt so much alike riding our bikes next to the Mediterranean, just prior to reaching Nice. There were the same steep drops into the ocean right next to the road, the small sandy beaches, the snake like road determined to follow the coastline to the letter. Only real difference being a significantly smaller number of high end Mercedes’ and palm trees. Road number 1 is more or less 1400 kilometers long. 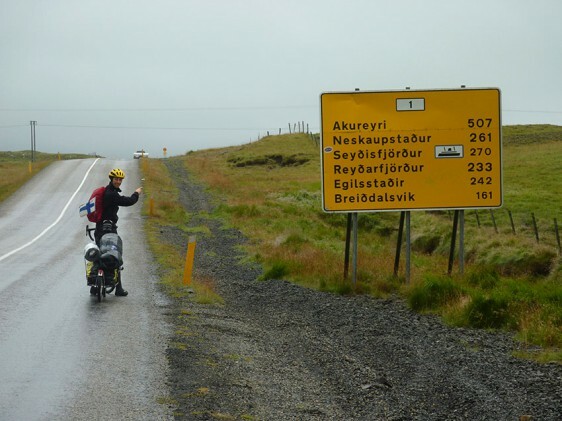 Add to that the circa 100 kilometers that come from going back and forth to Reykjavik from Keflavik, and your end sum will lie around 1500. So upon reaching Höfn, we’ve covered on third of our journey. In both variegated weather as well as terrain. Anyway, Giulia is an Italian lady, from Rome, so she too is far from home. Like most of us cyclists over here, really. It’s funny to think that during our ride here, we’ve met people from as far away as Spain, the States, even Brazil. 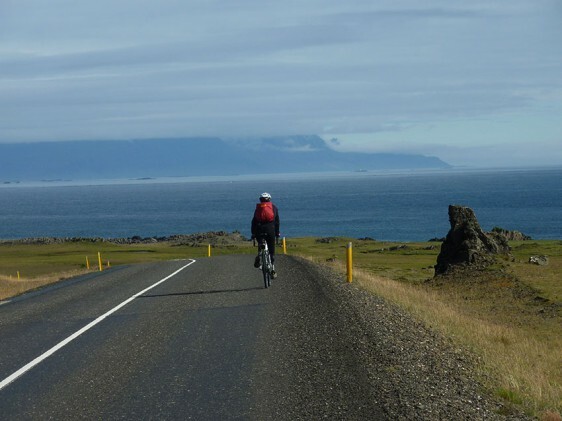 But not a single Icelander have we spotted on the road. Riding a bike, that is. Oversized jeeps – well that then is a different story. I wonder why that is? Maybe they know all too well what to expect. And yet, all of the beauty and adventure is right there, outside their doorsteps. Man doesn’t seem to be able appreciate anything in this world before it’s taken from him. Even on this very beautiful and strange island this place stands out as something special. 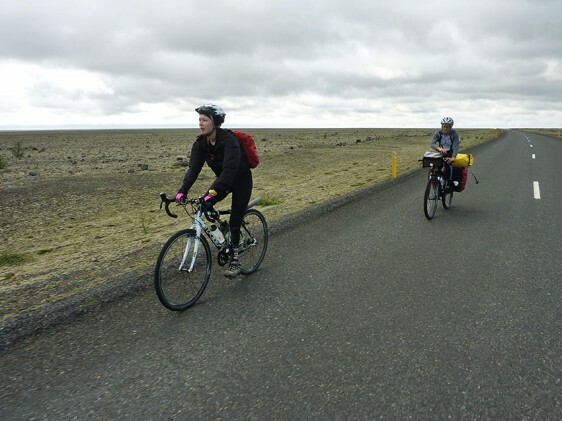 Smack in the middle of an otherwise boringly straight and monotonous road (of which there really is no shortage of in Southtern Iceland! ), it’s one of those places that tourism doesn’t seem to have reached quite yet. Which is kind of easy to understand, as all there is here is a field of small rocks. Surrounded by a damp, cold fog. An antidote for all that sensory overload modern life bombards us with. The site wasn’t always this desolate. Quite the opposite, in fact. 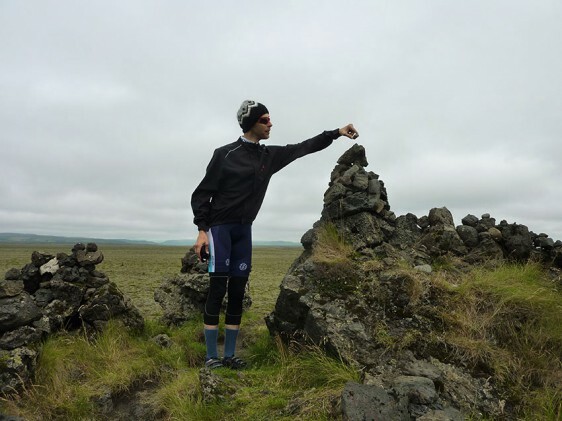 Once the ground upon which a large farm was constructed, only to be destroyed later on in an volcanic eruption. This all took place sometime in the 9th century. Killing everyone. Which lends even more credibility to the eerie calm one can perceive should one stop there. Ever since travelers have stopped here to add their own stone to top off one of the piles of stones. For good luck, for prosperity, for whatever reason the weary rider might deem important enough. www.1700km.blogspot.com – Our first ride, through Finland, all the way to North Norway and the Arctic Ocean. 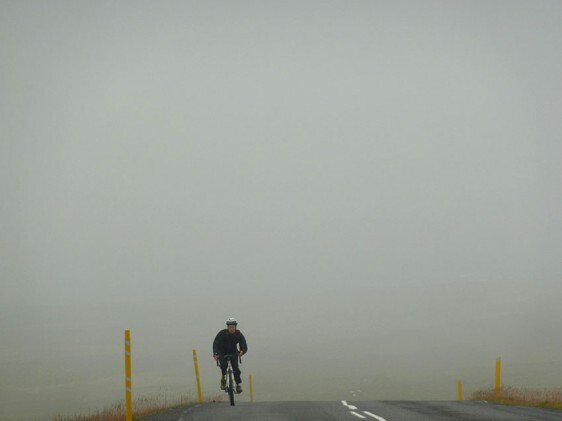 www.deuxvelos.blogspot.com – Our conquering of Continental Europe. Endpoint Nice. 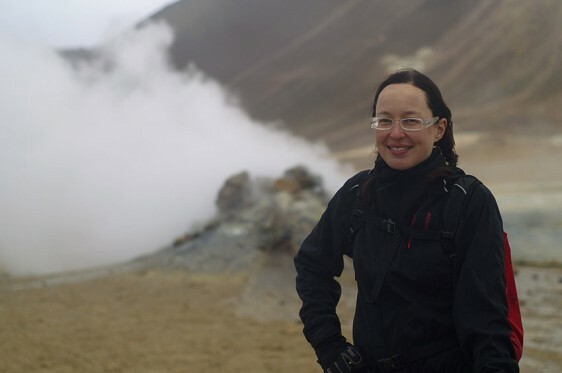 www.hringvegur.blogspot – Around Iceland. But you already knew that! www.trapinka.blogspot.com – When everyone tells us not to do something, it usually only serves to encourage us. 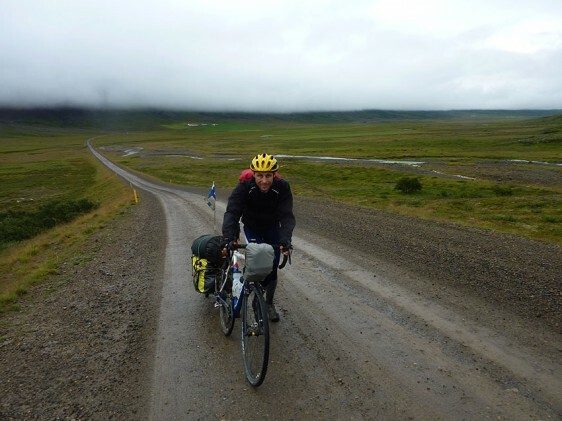 A cycling adventure along the Russian border, from our hometown in Borgå, Finland, to Murmansk, in Northern Russia. www.costaricabybike.blogspot.com – Occasionally it’s nice to ride in a place where the sun just might shine! Most entries in Finnish and Swedish, but always some English as well. Plus the photos transcend the limitations of language.